Winter Black Périgord Truffle Week! The Winter Black Périgord Truffle season is upon us and will last for another 6 weeks. The Black Perigord, or Tuber melanosporum, is the truffle that is the subject of epic stories written in iambic pentameter. This dark tuber with its marble-veined flesh has the strongest flavor and aroma of all the black truffles. The Périgord is indigenous to that region of France, which is also renowned for its Foie Gras, while Black truffles also can be found in Italy and Spain. Although truffles are found in parts of North America, Australia, and Asia, none compare to the quality produced here. Truffles have a symbiotic relationship with with trees, mainly oak and hazelnut, providing the truffle with sugars while the fungus in turn provides essential nutrients to the trees. The spores give off a scent, which is why specially trained dogs and pigs are used to dig the tubers in the wild. Now, fresh truffles are not to be confused with Truffle Oil, which are not made from truffles. These oils are artificially made with thioethers chemical compounds (2,4-Dithiapentane). We do not use these oils. 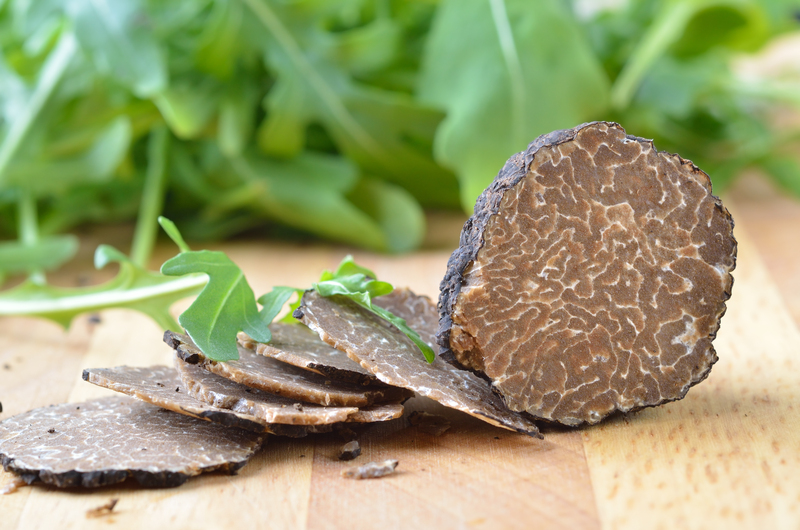 This week, we have assembled a menu to highlight and showcase the Winter Black Perigord Truffle. Retailing for about $120 per ounce, or $1,920 per pound, these certainly are one of the most expensive ingredients available (next to the White Truffle, also currently in season, which retails for $5-$6K per pound), but a little goes a long way. A few slices of Fresh Black Winter Perigord Truffles adds a strong and robust accompaniment to any dish.